Japanese hornets are the largest hornets in the world, growing to be about 2 inches long. 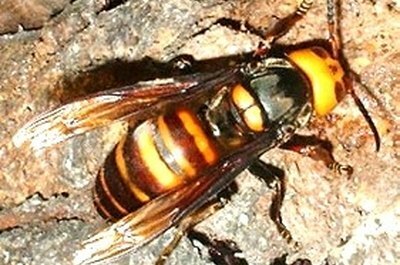 The Japanese hornet emits an enzyme that can dissolve bone and tissue, and can be fatal in some cases. This makes their removal all the more important. Follow the steps given to learn how to get rid of Japanese hornets. The first step in getting rid of Japanese hornets is to get rid of their food sources. Make sure that any compost piles and trash areas are properly secured. Place garbage that is stored outside in a closed bin or can, and keep compost piles and other areas covered as well. This cannot only help get rid of hornets, but prevent them from settling in the first place. There are a few traps that you can make or buy to naturally remove hornets from your home. The first is a bucket trap and can be bought at many hardware or garden stores. To make your own bucket trap, fill a bucket up partially with water. You will then need to add in sugar, vinegar, and a few drops of dish detergent. The sugar and vinegar will attract the hornets, and the dish soap will help keep them from escaping, causing them to drown. The second kind of natural trap you can make yourself is a queen trap. A queen trap is a trap designed to catch hornet queens before they even begin a hive, which eliminates the problem before it begins. To make a queen trap, start by cutting a 2-liter bottle maybe a 1/3 of the way down, and then turning the top you cut off upside down and placing it back into the bottle. Place a small amount of water in the bottom of the bottle and tie a piece of raw meat to a string about an inch above the water. Place the trap out on the first warm weather day you have in your area. The raw meat will attract the queen, and she will eventually drown when she can't find a way out. If you don't want to go the natural route, you can get rid of hornets with pesticide sprays, but this could cause risk to you. Japanese hornets get extremely mad and protective when provoked and will attack you. If you choose this method, then you will need to wear protective clothing before you begin, as Japanese hornet stings can be dangerous. You will also need to know where the hornet nest is located before you begin. Japanese hornet nests only have one opening and way of escape. Once the nest is located, you can approach it late at night and place the pesticide spray in the opening of the nest. Do not break the nest open, or you will give the Japanese hornets a way to escape and attack you. Be quick when using this method and leave as soon as the pesticide has been sprayed. Spray for getting rid of these hornets can be found at your local hardware or garden store. Please see the resources for more information on Japanese hornets. Cold weather will kill Japanese hornet nests, so remove them in cold weather to ensure no new hives reappear. Wear protective clothing when dealing with Japanese hornets. Based in Florida, Kathleen Bunn has been working as a professional writer since 2006. She holds and associate's degree in elementary education from Tallahassee Community College, as well as an x-ray technician's license from Keiser College.